You may find this a tenuous connection to dining but nevertheless here at DR we feel it our responsibility to explore the ultimate in casual dining with a fine dollop of working up the old appetite. With this mission in mind Ms S and Mrs P enthusiastically volunteered (while under the influence?) 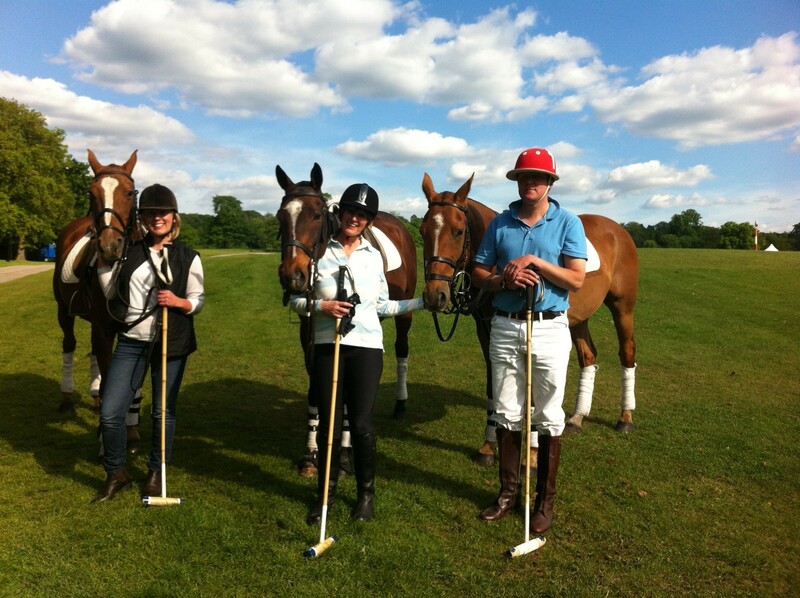 for a polo lesson appetizer at Guards Polo Academy, based at the ever so stylish rural deluxe of Coworth Park in Ascot. A mere sneeze from polo’s immortalized home at Smith’s Lawn in Windsor Great Park, you can enjoy the ever patient/ funny/ relaxed/ encouraging / brilliant tuition from experts – in DR’s case, Guy. Now we first need to explain that Ms S had not ridden for 20 yrs having been traumatised at a tender age by her child-hood pony Zebedee (an obsessive jumper). Mrs P from Maiden Voyage, the queen of understatement, described herself prior as a ‘nervous rider’ so we were not dealing with expert horsewomen here (although Mrs P did later reveal she had a CV in dressage training and recently trekked the Pennines). There was nothing scary about this taster lesson however. You first learn to swing – think croquet but surprisingly you turn your stick sideways for a side hit; put a highly responsive, ultra clever pony beneath, watch the ball, carefully aim (keep watching the ball!!!! ), swing, follow through and whatever else you learn DON’T HIT THE HORSE WITH YOUR STICK!. Hey presto – Ms S and Mrs P were trotting around and hitting the ball by the end of the hour with zeal, Ms S eager for match play. With giddy heights achieved and the generous hour lesson over oh too soon, the newly initiated polo addicts jumped in the car down the single track to Coworth Park Barn for a late afternoon of Pimms on the terrace, celebrating being in one piece. So here was the quintessential English experience; brilliant early evening sunshine, a refreshing fruit filled Pimms, wandering swans, ponies meandering on distant polo fields and in the foreground the impressive Dowagers Cottage to the main Coworth Park house. Deciding upon a wee snack before heading off home Ms S chose a quickie vegetarian main course of carmelised red onion and goats cheese tart with roast minted new potatoes and rocket salad (because she’s veggie). Mrs P choose fish and chips, crushed peas and tartar sauce (because she’s northern). Mrs P was delighted with her choice describing “a definitive batter encasing the succulent opaque fish delicately flaking apart”. Ms S adored her flavoursome tart but hankered for minted roast new potatoes to be ‘un-roasted’ to encapsulate the flavour fully, although she openly admits she has always thought roasting new pots a travesty. That said, the day wasn’t about food but more the beautiful unpretentious destination, glistering weather and joive de vivre of laughter-filled company and new experiences – where life feels utterly fulfilled and you wish every Monday could be like this. 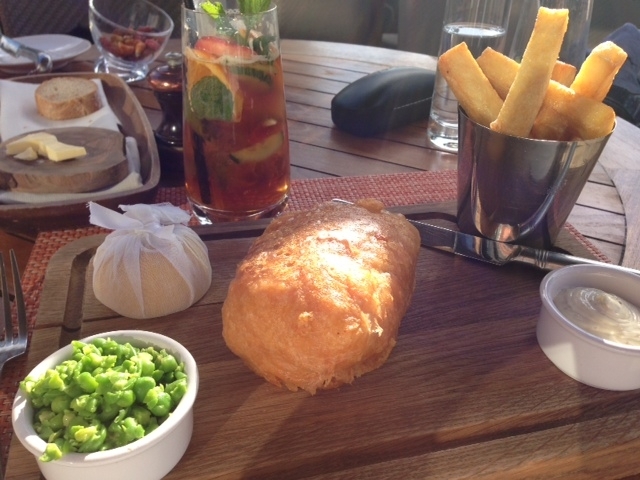 Members enjoy 10% off the total food and beverage bill on dinner Sunday to Thursday and lunch Monday to Friday. To book at The Barn at Coworth Park please click here. 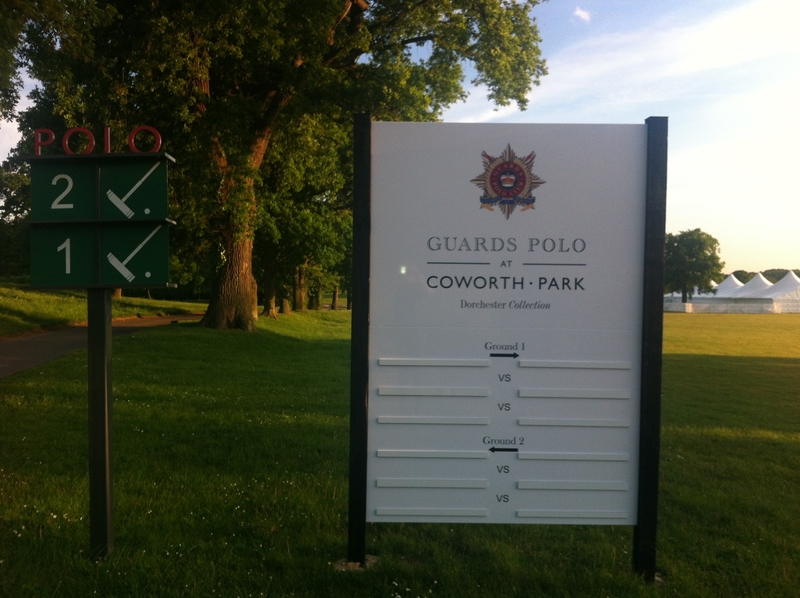 To enquire about polo lessons at the Guards Polo Academy at Coworth Park email ahine@guardspoloacademy.com. Not a member? To find out more about Design Restaurants membership club offering fine dining benefits and lifestyle offers please go to www.designrestaurants.com. Previous articleCompetitionsTwit - Twoo Competition and Owls at Sunset! I have to say, horses, great company, pushing yourself out of your comfort zone, hearty food a little dose of fear can cure absolutely anything, most especially the Monday blues, and set me up for a wonderful week. I will absolutely be back for more, even if it’s just to hear Guy say, “push them on ladies, they are meant to be sports horses”!